Smartphones are used commonly these days but they are usually not durable. Almost every smartphone owner knows that he has to protect his phone from dropping on road or water. Now there are phones like Sony Xperia XZ and the Galaxy S7 that are waterproof but even now there is no guarantee of protection about dropping the phone on concrete. Also, there are several phones that are not waterproof. Therefore, the possibility of dropping and damaging your phone is a possibility. You should be prepared for this by having back up of your contexts, messages, photos etc. But most of us are quite lazy and many times the undesirable thing happens before having any preparation. Following are the scenarios that you can face after dropping your phone. You can know the remedies in the sub headings below. If the screen is cracked but image is available and touch is working then it means that digitizer is saved which is used to convert analog touch signals to digital signals. But the first thing you should do immediately is to backup your essential data and photos. 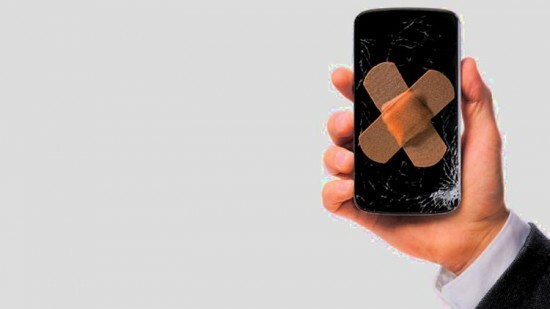 It is because these cracks on screen can spread further and cause damage to screen later. After doing backup, you should work on these cracks. If the touch works and screen in a usable condition then most of the people don’t try to fix the screen. It can prove dangerous and you can hurt your finger from this scratch screen. You should check the cost of repairing the screen from a phone repair shop and it should be quite low if the digitizer is working. Depending on your phone, it may cost few thousand rupees. But if it is difficult for you then you can at least use tempered glass screen protector to protect your fingers and it will also prevent further damage of screen glass. The sign that digitizer has been damaged is that the screen is working but the touch is not responding. Initially, you have to take out your data and then get your device fixed. You have few options left to use your device without the touch. Using a Portable Mouse via USB OTG: There is a built-in support of mouse in many Android devices. You can find this in your phone through internet. If it supports then you should purchase a USB Mouse and USB OTG Cable from a mobile shop. Use OTG cable to plug in your mouse into Android’s micro-USB port after which a small pointer will appear on the screen. Now you can use your mouse like touch functionality of Android. Using ADB: You can create a virtual bridge between your PC and Android and then unlock your device by using Android Debug Bridge. On your device, the USB debugging must be enabled. Android Data Recovery Software: You can also try to take out data from your device by using several Android Data Recovery Softwares. Google Backup: your contacts and most of other account data should be available in your Google account if you have enabled Google’s backup options. Your contacts will be available at Google Contacts and photos in Google Photos. iTunes Backup: There is a chance that iTunes will remember the password of your phone and it will not be required to unlock the phone if your iPhone is already synched to an iTues on computer. Start the backup process by launching iTunes, connect your iPhone to computer, click ‘summary’ and click on ‘back up now’. Use an already-paired Bluetooth device to Unlock: If there is problem opening password through iTunes then you can unlock your phone through an already paired Bluetooth keyboard. But already pairing of device is necessary to successfully execute this process. iCloud Backup: Your iPhone will automatically backup your iPhone data whenever it is connected to Wi-Fi in case you have enabled iCloud backup on your phone. Backup without iTunes using Dr.Fone: You can try and backup your iPhone by using third party software if everything else fails. If the phone powers on then a chance remains even if both the screen and touch stops working. Few of such methods are listed below to making your device working that case. Using ADB: in case USB debugging is enable on your device, you can unlock your device by using Android Debug Bridge that will create a virtual bridge between your Android and your PC. Android Data Recovery Software: You can try to take your data out from your device by using several Android recovery softwares. Google Backup: Your Google account will have your contacts and other accounts data if you have enabled backup options of Google. Your contacts and photos will be available at ‘Google Contacts’ and ‘Google Photos’ respectively. iTunes Backup: iTunes can remember password of your phone if your iPhone is already synched to an iTunes on computer. Connect your phone to iTunes after opening iTunes. Now click ‘summary’ and then start backup process by tapping ‘Back Up Now’. iCloud Backup: Your iPhone will automatically backup all or some of your data after connecting to Wi-Fi if you have enabled iCloud backup on your phone. Backup without iTunes using Dr.Fone: The last option to backup your phone is by using third party software. If phone doesn’t turn on then it is the worst thing that happens. In this case, you can’t take out any data from phone without fixing it. If you have already made some backups on your Google Account (for Android) or iCloud or iTunes (for iPhone users) then you can save some data.